Las Vegas has a subtropical and hot desert climate that can make your home extremely uncomfortable in the summer. Without air conditioning, your Las Vegas home will feel like an oven – with temperatures reaching up to 100 degrees Fahrenheit, it can get really hot and dry inside your home. Solar screens are fantastic additions to your windows that have the capacity to lower your energy bills by preventing the heat of the sun from penetrating through your windows. Though more expensive than traditional blinds and shades, solar screens have quick returns on investments with eventual lower energy consumption – making it a cost-effective and energy efficient way to make your Las Vegas home ultra comfortable. Because these screens keep your home cooler and keep UV rays out, you will no longer have to use your air conditioner as much, prolonging their lifespan. This also goes with your heater, where the screens keep off the cold winter winds off your glass windows, helping to keep your home’s interior space warmer – and reducing your needs to turn your heater on at all times. The way solar screens work is they shield your windows from the glare and heat of the sun, absorbing the heat and dispersing it back into the air, so it doesn’t ever touch your windows. By making your living space comfortable, solar screens prolong the lifespan of your heater and air conditioner. Solar screens also keep the temperature down from UV reflection to preserve your landscape. There are several varieties of solar screens and Fast Track can even custom-make them to fit the overall look and design of your home. Because they come in all shapes and sizes, color, and material, we are here to guide you so that you don’t have to worry about your home sticking out like a sore thumb in the neighborhood. In fact, we will make sure to enhance the look and overall curb appeal of your house. And while they’re placed outside of your windows, they don’t block the view from the outside, and they also allow natural light to come through. How many times have you replaced a carpet, a sofa, or a table due to UV fading caused from exposure to the sun’s damaging heat and glare? Solar screens protect your furniture and other home furnishings by blocking direct exposure to sunlight, so you won’t have to keep replacing them every few years. Our solar screens come with a ten year warranty so you won’t have to worry about having them replaced every year or two. Essentially, this also saves you money in the long run, compared to traditional window treatments such as tinting. Solar screens are essential for Las Vegas homes simply because the city’s hot desert climate is extremely damaging, as well as making your home uncomfortable to live in. 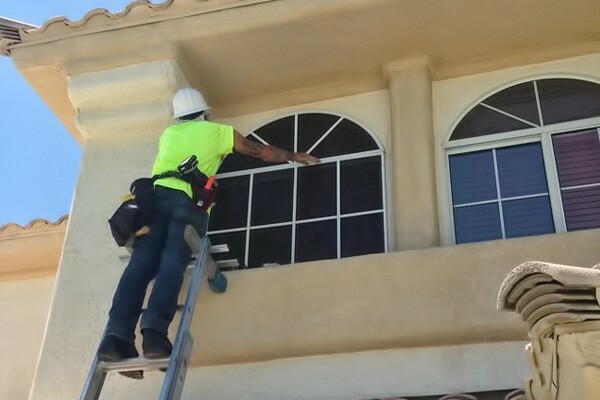 Most companies who sell solar screens subcontract the manufacturing and installation through third party companies, whereas at Fast Track, we keep everything in house from start to finish and have the experience and expertise to evaluate what works best for your home while providing the best level of service. With over 300 days of sunshine in the Sin City, solar screens are a complete must for any home. We are always more than happy to provide a free in home consultation to see what options would work best for you.